Order before 12pm & receive nationwide next day delivery (max weight 75kg). Next day delivery on heavier orders also available on request. Early mornings – Saturdays – Sundays also available. At Great Grass, we constantly strive to make your shopping experience as enjoyable & easy as possible. Being people too, we share the common frustration with long delivery lead times & lack of choices available when it comes to delivery of products & goods. As such, Great Grass constantly strives to improve our logistics. Our aim is to create the highest level of customer satisfaction, we believe, being transparent, keeping our customers informed, providing choice & offering the best value. All orders over £400 receive FREE standard delivery within England, Wales & Scotland (Additional charges may apply for Scottish Highlands, Channel Islands & Northern Ireland, please contact us before placing your order). If the weight of your order is less than 75kg, we shall dispatch your order for the next working day. Please see below for heavier orders. All orders under £400 incur a subsidised £20 delivery charge; we are currently in the process of exploring delivery options to eliminate or reduce this cost, at present Great Grass contribute towards the delivery as not to pass on the full cost to our customers. This applies to all deliveries within Mainland England, Wales & Scotland (Additional charges may apply for Scottish Highlands, Channel Islands & Northern Ireland, please contact us before placing your order). The majority of orders made before 10:30am Monday to Thursday will arrive the next working day on our standard delivery option. Deliveries shall arrive between the hours of 9am and 6pm. 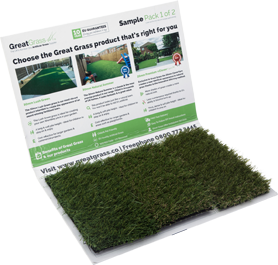 If you are about to make an order with Great Grass via the telephone or in-store our staff will be able to inform you how long you would expect to receive your order via our standard delivery options; this is dependent on the total weight of your order. Orders, which customers place via the Great Grass website, will receive an email with a receipt & a follow up phone call to discuss your delivery options. As standard, our orders will be delivered at the earliest to our customers but we understand that many of our customers have preparation of their gardens to take care of or personal commitments, which means they are not available to receive their order. We undertstand people have commitments as such we can purposely delay your delivery to a day that is better for you. At the present time, our couriers’ can provide additional delivery options at a premium cost; we are passing on these options to our customers at cost – the price at which we are charged for these services. For an additional £15, our couriers will deliver pre-noon on deliveries in the week. If your order is over £400 & includes FREE standard delivery the additional cost would be £15. If your order is under £400 and you would like a Pre-noon drop the £15 will be added to the standard delivery price of £20, the total cost would be £35 in this situation. For an additional £35, our couriers will deliver before 9:30am on deliveries in the week. If your order is over £400 & includes FREE standard delivery the additional cost would be £35. If your order is under £400 and you would like a before 9:30am drop the £35, will be added to the standard delivery price of £20, the total cost would be £55 in this situation. For an additional £35, our couriers will deliver pre-noon on a Saturday. If your order is over £400 & includes FREE standard delivery the additional cost would be £35. If your order is under £400 and you would like a Saturday pre-noon drop the £35 will be added to the standard delivery price of £20, the total cost would be £55 in this situation. At the present time, our standard couriers does not any additional delivery options. We are working closely with our couriers to provide more options in the future. We can on occasions use a dedicated vehicle for your order if time is of the essence, please read more below. Used more so by our commercial team. In the event that a customer requires a delivery, the same day for an event or exhibition or the order is very large. We will work with our clients & services provides to provide a service to ensure you recieve your artificial grass when it is needed. If you would like to take advantage of these services or you have an urgent commercial project please contact our commercial team. We understand your home is precious & we take extra care working with our contracted couriers to ensure it stays that way. With Great Grass, you can be confident that your goods will be packed to the highest standard. Our couriers are fully trained to give the best possible service. The service offered is to your door but more often than not, the couriers will assist with placing your goods where you desire. If you do invite the courier into your home this is done at your own risk of any damages that may occur. Although we work very hard to ensure your delivery is up to the highest standards; thing can happen, such as a vehicle break down or human error. If this occurs, we will ensure that own Great Grass member of staff and that will handle the problem ASAP. You can call us at any time you require assistance on 0117 205 0947.